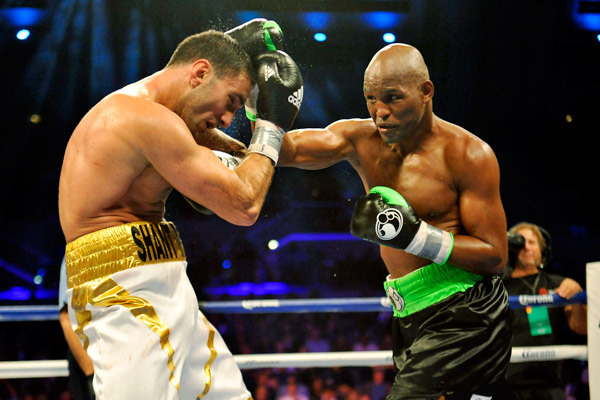 Shadowy and intimidating, the mind of Bernard Hopkins is like a Gothic castle whose cellars and spires store dangerous knowledge that will lead to your demise. It is best to remain outside its walls. This is true to a degree. As a man and as a boxer, Hopkins’s (55-6) greatest asset is his brain, and throughout his twenty-six year career he’s out-thought men who were outfitted with greater physical gifts. Equally true is the cult of brilliance Hopkins has fostered about himself. His self-aggrandizing, which is consistent and vigorous, is as much a psychological tool as it is a plea for attention. By constantly talking about how smart, experienced, and wise he is, he manufactures the idea he’s omniscient and will inevitably find and exploit your weakness. Opponents who subscribe to this myth are doomed before the opening bell. In advance of most fights, Hopkins tries to lure opponents into his wicked labyrinths. It’s a tactic he excels at. Prior to his knockout of Felix Trinidad in 2001, Hopkins infamously threw a Puerto Rican flag on the ground during a press conference in San Juan, which nearly caused a riot. His objective was to raise the fight’s stakes, so that Trinidad knew that by losing he would disappoint an entire nation. The pressure worked to his advantage as he wore down and smashed the Puerto Rican in front of his Boricuan fans at Madison Square Garden. 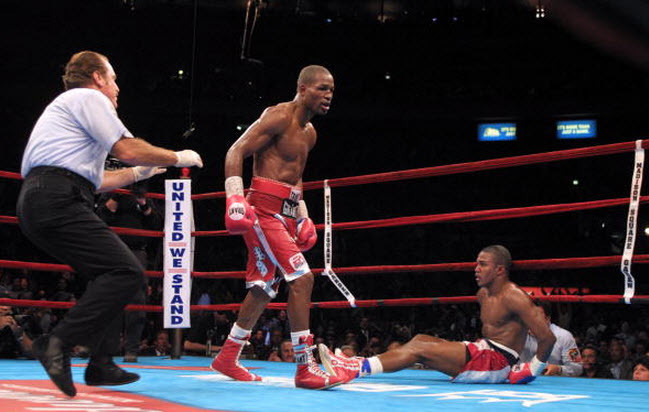 Hopkins drops a flustered Felix Trinidad. The Philadelphian still makes use of skulduggery, but its emphasis is now on his exceptionalism. 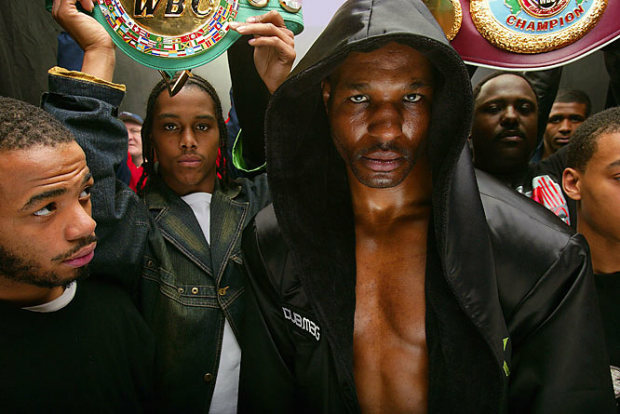 Hopkins continually reiterates that, as a forty-nine-year-old boxer, he’s defying nature’s laws by continuing to compete at a championship level, and because of this qualitative, unearthly rareness, trying to beat him is a fool’s errand. Boxing’s once self-appointed ‘Executioner’, Hopkins made a record twenty title defenses at middleweight, scoring career-defining stoppages over Trinidad and Oscar De La Hoya. 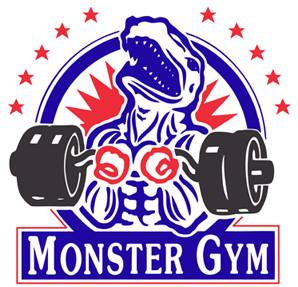 Competing as a light heavyweight for the past eight years, he’s restyled himself “The Alien”. How else, he asks, could a man two months away from turning 50 remain such a force if he’d not been spawned in another galaxy? Hopkins’s age is remarkable but easily forgettable; he has been a fixture of boxing for so long that his presence has become somewhat banal, even when we make concerted efforts to remind ourselves that what he’s doing is remarkable. One could use his longevity as an indictment of the sport’s shallow talent pool, but this would miss the point. 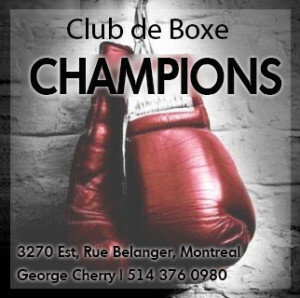 When Hopkins won the WBC light heavyweight title with a brilliant victory over the robust, hard-punching Jean Pascal, a man eighteen years younger than him, he did so as a forty-six year old. His style relies on calculation more than athleticism, which lends itself to a long career, but he is still an outlier. 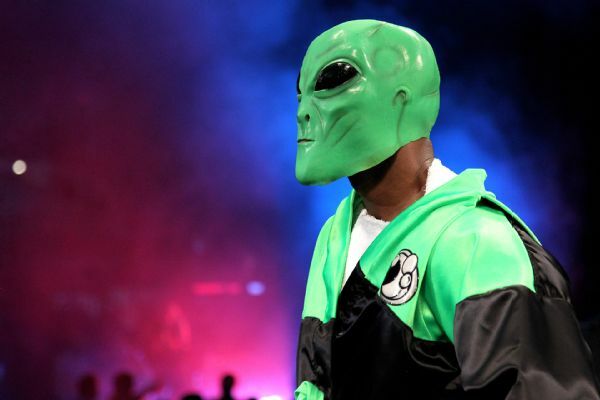 Once the “Executioner”, Hopkins now enters the ring as the “Alien”. The results substantiate his egocentrism. It’s easy to believe in his high appraisals of self given his repeated success. The other, earlier details of his life round out his ghetto-wizard mystique: his violent youth spent in North Philadelphia’s Raymond Rosen projects; his four-and-a-half year prison stint; the firmly ascetic lifestyle he adopted upon release that he still maintains: all of this marks him as one who has risen above life’s worst circumstances. Having distinguished himself on the street and in prison, the ring is the substitutive stage on which Hopkins can prove himself the strongest and smartest while remaining within the law. Proving himself superior continues to be Hopkins’s obsession. He can be a difficult man to like, particularly when, during interviews, he refuses to answer questions directly, preferring to lecture his interlocutor on how little they know about what they’re asking. The “Alien” isn’t the most entertaining fighter either, for rarely does he engage in unmitigated brawls; his instincts of self-preservation don’t allow for unthinking violence. “I really believe and understand that I am different and not a part of this world, but in the world,” he said on a recent conference call to explain his monasticism and hunger to compete. ‘I am better than you’ is his implicit message, which is wearisome but difficult to argue against if the measure of a man is his ability to excel in a fistfight past middle age. 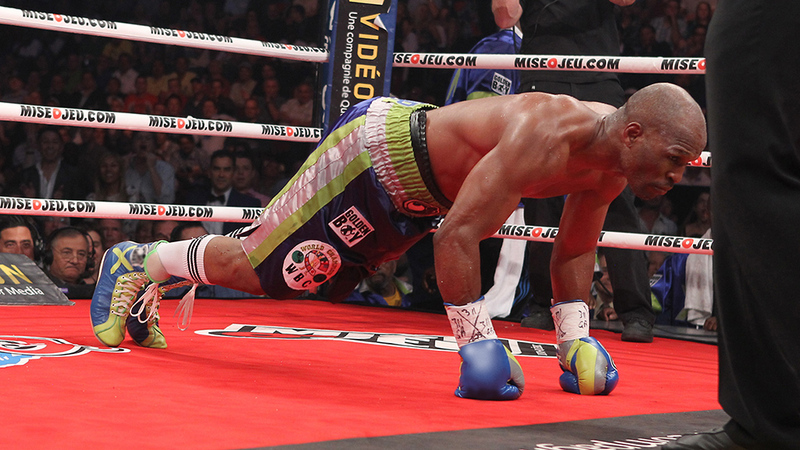 Hopkins does push ups during his rematch with Pascal. Hopkins’ upcoming bout reinforces the exceptionality he so eagerly extols because, more than any of his matches from the last several years, it’s fraught with danger. This Saturday he takes on Sergey “Krusher” Kovalev (25-0-1), one of boxing’s scariest punchers, at Boardwalk Hall in Atlantic City. Kovalev comes from Chelyabinsk, near the Kazahk border in Russia, and like Hopkins overcame early poverty to find success as a fighter. He hasn’t dueled anyone nearly as canny as ‘the Alien’, but he’s looked so dominant against second rate competition that he’s become the sport’s most feared man after Gennady Golovkin. He packs abundant power into his lithe arms, and breaks down his opponents with the rhythmic ruin an axe man applies to a tree. The Russian’s temperament is markedly different from the American’s. Kovalev smiles easily and often, and doesn’t exhibit the same outward egomania that Hopkins does. The bashfulness he displays in conversation is contrasted by his viciousness between the ropes. Kovalev is a fearsome puncher and sometimes fights with clear disdain for his opponents, talking at them as he rearranges their organs. He relishes knocking people out, but Hopkins has never been stopped and his durability will test Kovalev’s patience. One of the fight’s most interesting questions is whether he can handle Hopkins’s bullying, but Kovalev gives no indication he’ll be negatively affected in the same way that Felix Trinidad, Winky Wright, or Oscar De La Hoya were. Confident and eager, if he doesn’t allow Hopkins to dictate the stylistic war, he can win. 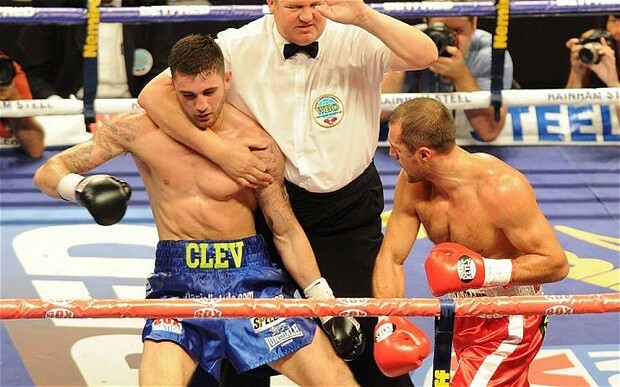 Kovalev destroys Nathan Cleverly in the biggest win of his career. Hopkins has only lost twice in the last six years, with both defeats coming to southpaws in Joe Calzaghe and Chad Dawson. Calzaghe is now in the Hall of Fame and Dawson, while an inconsistent performer, is a polished boxer who found a way to remain outside of Bernard’s reach and land scoring shots. Kovalev is technically sound and fights with an attractive, relaxed posture, but he relies more on straight-ahead aggression than subtle boxing skills. Neither Calzaghe nor Dawson provide him with a blueprint for success. Rather than try to outfox Hopkins, Kovalev must fight in his preferred manner. He can’t let Hopkins retard the bout’s pace to where it becomes a plodding exercise of holding and clinching, as this will nullify his power. 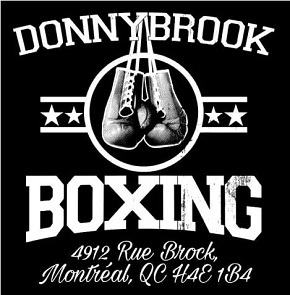 He must fight offensively each round, something Jean Pascal couldn’t do in either bout with Hopkins. But while being uninhibited, Kovalev must be careful not to leave himself vulnerable to Bernard’s body shots; the “Alien” hasn’t earned a stoppage since a left hand found Oscar de la Hoya’s liver ten years ago. It is not Hopkins’ punching power, but the traps he sets, that Kovalev must be wary of while he puts his combinations together. Hopkins, who is always so sharp in his pre-fight preparations, doubtlessly has a plan to neutralize Kovalev’s frightening power. An obvious way of doing this is to make the fight an aesthetic nightmare, which Bernard is adept at. By clinching, holding, using his great infighting skills and making the long term ‘investments’ demanded by trainer Nazim Richardson (essentially body punching, which has an attritive effect), he might frustrate Kovalev and wear him down, leading to Hopkins scoring more easily in the later rounds. The Russian is prone to irritation when an opponent’s awkwardness prevents him from getting punches off. Look for Hopkins to make Kovalev uncomfortable by alternating his distances and fighting ugly. Hopkins lands on Karo Murat in what was a surprisingly entertaining bout. It has been said that once Hopkins beats someone, they are never the same. De La Hoya fought only four more times after losing to him, winning two. 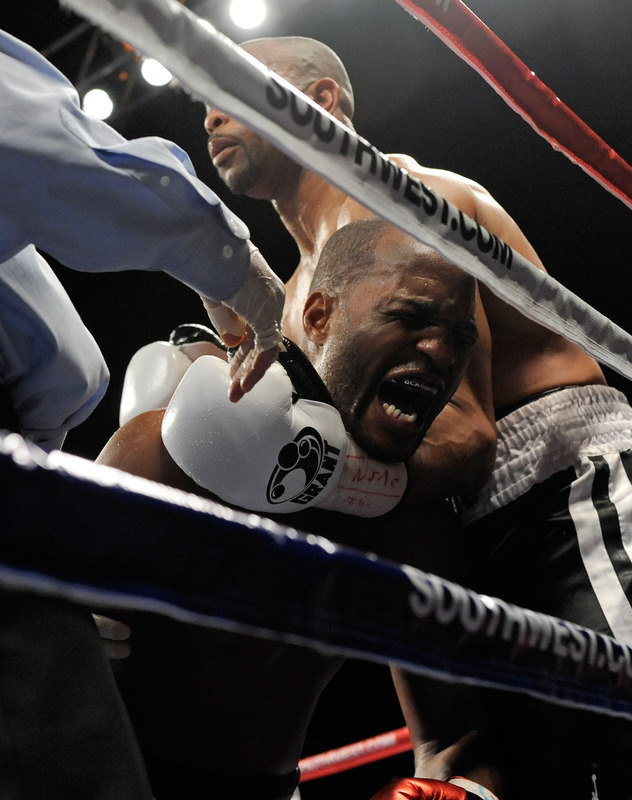 After being unanimously decisioned by the “Executioner,” Winky Wright fought twice more, losing both, and then retired. Trinidad, who was undefeated before getting brutally knocked out in the twelfth round, fought four more times, losing twice, and then left the fight game. In each instance a Hall of Fame fighter had their retirement day expedited by a date with Bernard, who gave them a clubbing that was equal parts physical and mental. He takes that much out of you. Unlike these three, Kovalev may be impervious to Hopkins’s mind games; he hasn’t looked flustered in the weeks leading up to the fight. If this is so, his chances of winning are significantly greater. Boxing angry is never advisable because rage makes you forget about technique, which disables you defensively and renders your offense imprecise. According to many boxers, it is best to fight with a modicum of detachment so anger doesn’t preclude calculation. Going into the fight in a stable state of mind and remaining that way is a difficult task, though. Once Hopkins starts employing the tactics that Kovalev already expects, we’ll see whether “Krusher” is disciplined enough to box through them. This will determine the complexion of the fight. Hopkins may now be the “Alien”, but he’s a master of the dark arts. Hopkins’s experience of the world, whether in the streets, in prison, or in boxing, has been governed by rules that only bend to strength and cunning. Over time he’s sharpened his mind to exploit these laws, and his brain is now a repository of knowledge composed of many chambers, each of which stores situational wisdom depending on his needs. When most successful, Hopkins has imprisoned his enemies in this mental fortress, where they’ve wandered its dark, confusing hallways, desperately in search of an exit the castle’s architect has hidden from view. Passage through his labyrinth leads only to the dungeon, where the lord became a legend for removing heads. But, since the “Executioner” has become the “Alien”, perhaps it’s not decapitation but interstellar kidnapping that Sergey Kovalev might want to avoid. If he can resist the pull of Hopkins’s beam Kovalev won’t be held hostage among the stars. Instead, he may become one. But that is a big “if.” Hopkins’s permanency has been made possible by his brilliance. Hardened by the street, tested by prison, and made beautiful by the ring, the Philadelphian’s mind is every bit the weapon the Russian’s fists are. Only if Kovalev stays on its outside will he live to see the sun rise. This was again a good read. Thanks. Thanks Scott, should be a great fight. Very well written, great job!